Our Vinnies Shops exist to provide a shopping experience which allows customers to buy goods from our shops with every dollar spent going back into the local community. We’re also able to provide direct assistance to those experiencing disadvantage through the provision of gift vouchers that are used to purchase items during tough times. 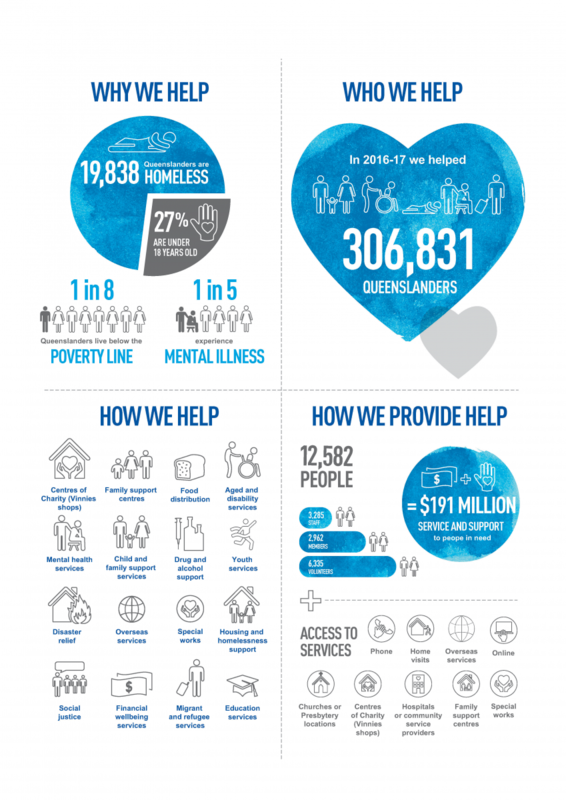 In 2016-17 in Queensland alone we were able to provide over $191 million worth of service and support to people in need. All donations sold in store have undergone a thorough in-store pricing process. The process begins when the donation is received in store, sorted and prepared for sale by an army of volunteers. Our volunteers price each item at rates that are both affordable and accessible. Pricing is based on the condition and quality of each, individual item. Our volunteers receive training and instruction on pricing and when in doubt, store managers are available for guidance. Our volunteers know the importance of making sure items are priced affordably, however they also understand that we have a responsibility to price our goods at a rate that allows us to help many people as possible. Finding a balance between those two requirements can sometimes be hard but we believe that more often than not - we get it right. It is important that we honour the donations we receive and price items based on their quality and ‘market value.’ When we receive a rare or unique item, we thoroughly research its potential value. We never want to over-price items, but we are mindful of fair value and careful not to under-price unique and valuable items. A donated item cannot be sold until it has gone through the in-store pricing process, ie cannot be sold directly from a Vinnies donation bin or in-store donation trolley. Vinnies Shops adopt a very local, grass-roots model of assistance. In addition to our shops, Vinnies has thousands of members across the state volunteering their time to provide support and assistance through our Home Visitation service. This allows us to specifically meet the welfare and emergency relief requirements of the immediate community. Each of our Vinnies Shops has a close connection to these volunteers, often working closely to provide clothing, food, furniture and financial assistance to people experiencing disadvantage. Their ability to provide this welfare assistance is a direct result of profits generated from the sale of goods in store in that local area. What about people who can't afford to shop with us? Our goal is to offer quality, pre-loved clothing and household items at affordable prices. We do however recognise that many people are simply unable to afford basic clothing and household items. In these circumstances our Conferences work with people suffering severe financial disadvantage – giving them access to the items they need - free of charge. Shops can and will deliver furniture and household items at no cost and our Conferences provide people with vouchers – enabling them to come in and shop for the items that they need and want. It is our intent to offer support and aid without judgement or stigma. Giving those less advantaged the opportunity to use a voucher and shop for themselves, is important and is a key part of the support and services that Vinnies provide.